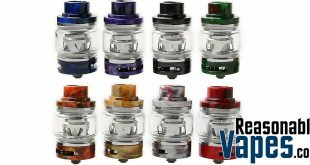 Here is the Augvape Skynet Sub-Ohm Tank and this one also uses mesh coil heads, which I think all sub-ohm tanks should at this point. The coil head that comes with this tank is a 0.15ohm mesh coil that vapes best around 80 watts. What’s more is the flavor production is pretty great on this one. Additionally the top fill system has very short threads, which means it only takes about a quarter turn to open it. This is great for ease of use and also to prevent leaking. 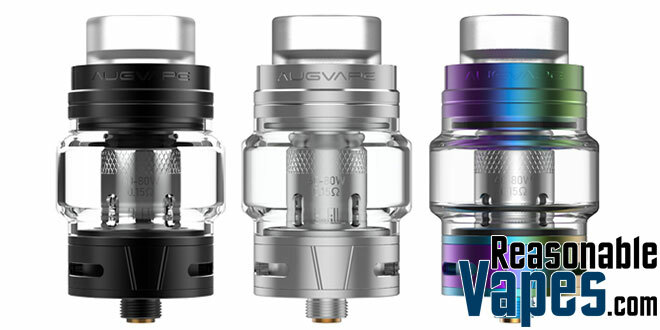 Furthermore there are 3 airflow slots located on the bottom of this Augvape Skynet Sub-Ohm Tank. As a result you’ll get plenty of airflow as well as thick juicy clouds. There’s a standard glass tube in the box as well as a bubble glass tube. With the standard one you get a 3.6ml capacity, and with the bubble glass you get a decent 5.1ml which is great. 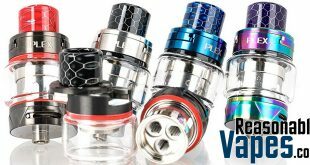 So this Augvape Skynet Sub-Ohm Tank is a fantastic choice for vapers looking for an easy to use tank while producing amazing flavor as well as clouds!